Many associate Brexit and the Trumpian trade wars with the start of a new phase of deglobalisation. This column argues that we should view them as symptoms rather than causes, as the world had already started to fundamentally change before either came on the horizon. Neither the delay to Brexit nor the extended pause in the US–China tariff war means that the risks of deglobalisation have diminished. While economists agree that the multilateral trading system is under pressure and that US trade wars and the Brexit chaos provide examples of behaviour that is completely new for the present generation, it is still unclear if we are actually in the midst of deglobalisation (O’Rourke 2018, 2019). Deglobalisation would imply a fundamental change in our economic environment but not a new phenomenon from a long-run perspective, because a period of significant deglobalization also occurred in the 1930. We can glean from history the pattern of emerging deglobalisation (van Bergeijk 2019). 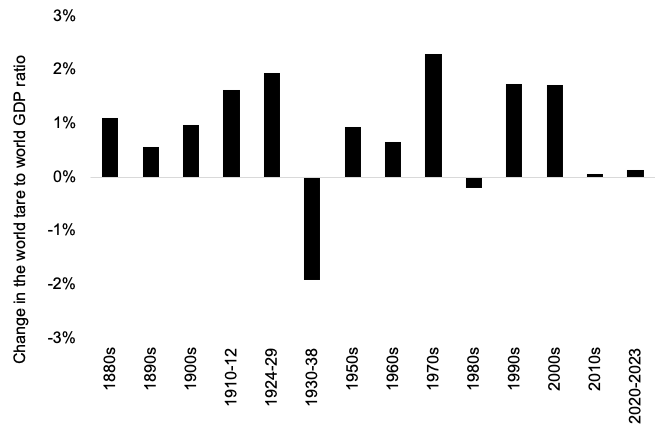 Figure 1 illustrates this historical perspective of alternating waves of globalisation (a more open world economy) and deglobalisation by means of the change in the world trade to world output ratio.1 The figure shows that strong globalisation phases are followed by decades in which the world’s trade-to-GDP ratio decreases or stagnates. What does the current pattern of emerging deglobalisation look like? Notes: The estimate for 2010-2023 is (partly) based on IMF forecasts. Note that the number of available years is limited in the 1910s and 1930s and the absence of the 1940s. Sources: Maddison (1995, 2001), World Bank World Development Indicators, and IMF World Economic Outlook data base. The start of the deglobalisation phase is a major economic crisis that reduces demand, increases uncertainty, and destroys confidence. Next follows a collapse of world trade and investment (Baldwin 2009). The collapse marks the end of decades of intensifying globalisation, and increasingly free international trade and capital flows. The start of a period of deglobalisation at first remains hidden under the veil of initial economic recovery, but later becomes clear and measurable. Figure 2 shows this pattern for the most recent phases and turning point. In the early 2000s openness (on the vertical axis) increased until it reached an all-time high in 2008 and from there deglobalisation sets in. Deglobalisation actually gains momentum around 2013 (and this leads to the recognition of the world trade slowdown; see Hoekman 2015). At the same time, uncertainty (on the horizontal axis) increases and moves into unknown territory. The figure makes an important point: deglobalisation started well before Trumpism and Brexit came on the horizon. Rather than being the causes of deglobalisation, we should therefore treat them as symptoms – the world had already started to change fundamentally and the wave of deglobalisation that we are currently experiencing may be here to stay for quite some while. Sources: Davis (2016) and data underlying Figure 1. The major difference between the 1930s and the 2000s is that authoritarian countries in the era of the Great Depression where more likely to reduce trade and openness, whereas reductions of trade and openness during the Great Recession were more likely to occur in democracies (van Bergeijk 2018). To some it may be especially worrying that the clearest manifestations of deglobalisation occur in democracies, because democracies built the Bretton Woods institutions (and the EU). Indeed, the popular anti-globalist movements currently seem to hit the system at its heart. It is unwise to downplay the issue of populism, but it is important to recognise that the turning point of globalisation in all major economies appears to have occurred well before the recent trade shocks. This is why the phenomenon of deglobalisation requires a much broader conceptualisation than the ‘backlash from globalisation’ or the ‘retreat from globalisation’ on which research is already well underway. Deglobalisation in the sense of reduced openness also occurs in countries where popular support for globalisation is still strong, and this is a research puzzle that has not yet been addressed. A second mechanism operates in the international arena. During both the Great Depression of the 1930s and the Great Recession, the leading economic power of the time deserted the rules of the game that underpinned globalisation and were actually designed by its initial interest in an open trade and investment climate. An open stable and relatively peaceful system, however, allows other countries to develop and grow faster, capturing a larger share of the benefits of globalisation. In the early phase of globalisation a smaller share from a larger economic pie may still be an improvement. At some point the costs of being a hegemon, however, outweigh the benefits. It is ironic, but sad, that the US and the UK (the hegemons that helped to build a constellation in which trade, democracy, and peace were reinforcing aspects of the world order) are opting against global and European governance. Deglobalisation is a structural transformation of the world economy. Political turbulence can perhaps hasten this process. To some observers, delays to the big topical trade shocks may therefore seem to help to turn the tide. Brexit and ‘Make America Great Again’ are, however, symptoms of underlying processes that have already generated significant trade and investment uncertainty and this is already exercising a concrete impact on trade and investment flows as firms and consumers are adjusting behaviour in anticipation of further trade shocks. The delay of the deadlines provides a pause at best. It is therefore pertinent to rethink global economic governance and make it resistant to deglobalisation. A repositioning of the extent of internationalisation is manageable, but then concerted action is necessary to make the required changes in the rules and regulations of the world economic system. Those rules and regulations should be redesigned to meet the requirements of globalisation and, as recent experiences have made crystal clear, also meet the challenges posed by a wave of deglobalisation. Globalization has to stop (and somewhat reversed) for the environment’s sake—barring Star Trek levels of energy efficiency. Full stop. It’s insane that the cotton for America’s tube socks are grown in Egypt, shipped to Pakistan then shipped to Long Beach. That used to be all done in the American South from cotton to bath towel. Globalization creates multiple opportunities for corporate tax avoidance. That might be the real reason for globalization. The factories were predominantly in the north for a hundred years before the move south. I forget when that move came. Maybe 1880 to 1920? Star Trek wasn’t based on energy efficiency but on what is relative to our current level of technology magical new sources of energy. Which is what is needed in our case too — increases in efficiency are on a linear scale and can only go so far due to fundamental physical limitations, while what is needed to sustain a civilization whose socioeconomic system is predicated on exponential growth is exponential increases in energy availability. And even then, those cannot continue forever. Again, due to the laws of physics at their most fundamental level. Also, efficiency and resiliency are usually not compatible with each other — if you make a system as efficient as possible, you eliminate the margin that would allow it to better weather a disturbance. So what has to happen is not so much a reversal of globalization, but a transition to a steady-state system and, because all of the above was theoretical while in practice we have no such magical new sources of energy anywhere in sight, a drastic shrinkage of the scale of the human enterprise. Globalization extended the reach of concentrated European and American capital across the entire world, and now that other centers of concentrated capital have developed, the Europeans and Americans are pumping the brakes on globalization in an ill-fated attempt to retain their hegemony. The problem is the industrial capital is already all in Asia, and the West’s advantage in financial capital rests on eroding foundations. That is a very interesting comment. Thanks. The problem is the industrial capital is already all in Asia, and the West’s advantage in financial capital rests on eroding foundations. While the U.S. capacity for making its own stuff is attenuated, I don’t believe it is has yet been reduced to the extent that our natural capacity for a high degree of autarky is compromised. The U.S. is not resource dependent as are many other nations upon far flung imperial holdings and satraps, or upon trade for the necessities of life. Particularly for the U.S., the drive for empire and global trade is based on the needs of capital, not the material needs of the people. The former British and Spanish Empires are a good example (and both more directly relate to the establishment of the USA). Brexit – those industrial areas that may have seen more benefit from the British Empire in the past are seeing it no more. Yet, these narratives of awe about “rising empires” being built to “lead the world” persist. It might be argued that empires exist only to protect the owners of capital. They have no belief in any other duty. Despite the whining about China rising or whoever, the owners of capital need an empire somewhere. I am not concerned about EuroAmerican capital hegemony. I am concerned about survival for the capital-less majority within America itself. I see our survival chances enhanced by the abolition of free trade and a return to semi-autarky with some limited trade perhaps permitted. And that’s the historical pattern since Sumeria: a system arises that “globalizes” (in early iterations, still fairly local) with a hegemon that administrates the Pax, marcher societies arise that go from consumers to producers, the hegemon goes down, the system deglobalizes, and sometimes a marcher society institutes a new globalization — and sometimes the system stays deglobalized for a long time, until a new technological revolution builds a new hegemon. I believe there was a Rand-type study group on this 30 years or so back — they identified the pattern, but they seemed unable to discuss the underlying cause. So instead of having a productive person working in the US, she ended up doing out-sourced work in Mexico “taking a job away from an American” (happy ending – she got taught how to code and is now doing much better than call center work). I think globalization is beneficial as long as wealth and income inequality and corporate power are constrained. If used as a tool to maximize inequality, as it did in the 1920s and the 1990s-2000s, then it becomes unstable. We are currently seeing the paroxysms of such a period of instability. Besides checking Consumer Reports, often free online at your local library, one of the things we do before buying any large product or expensive service is to call the customer help line. If connected to a non native English speaker, it means we look at their competitor. It’s hilarious how foreigners are coached to lie about being in the U.S.
No mention of Central America, South America and the Caribbean. Net immigration to the U.S. of tens of millions. I think globalization is beneficial as long as wealth and income inequality and corporate power are constrained. How do you suppose they will be constrained? A world governing body? It’s hard enough to constrain them within a narrowly defined geographical entity. And history shows, again and again, that the governments of all these entities, certainly since the rise of nation-states, become corrupted by the financial powers and end up serving only their interests at the expense of the masses. That is until they crumble or are swallowed up by other entities, which may or may not be as corrupt upon their takeover, but eventually become so. And the process starts again. It doesn’t matter if the governing body is democratic, monarchic, or of any other manifestation. There’s an interesting body of work that shows that people have lived just as well under monarchies or even some alleged tyrannies as under democracies, but that’s a different conversation. I believe Michael Hudson has explored this premise, among many others. There is also always a myth of progress inherent in the cultural belief systems. Ronald Wright documents this in his “A Short History of Progress.” Basically, all civilizations become victims of their own success. They end up becoming too big, too complex, and ultimately exhaust all their resources. Globalization is unprecedented in that it preys upon the entire world in the same voracious manner that formerly geographically-contained entities did. I fail to see how globalization is in any way beneficial. And it’s frankly hard to see it ending well. Every time something is shipped across an ocean, or air-freighted across an ocean, more global-warming carbon dioxide gas is dumped into the atmosphere. Globalization is a major cause of global warming just on all the bunker oil burned to move all those container ships around. Abolish Free Trade and take all those ships out of service and carbon emissions drop right there. If the purpose of globalization were truly for “trade, democracy and peace” we’d have no problem. But that’s just the fantasy. The only purpose is the accumulation of capital. If we were to restructure global economic governance to “make it (trade) resistant to destabilization” we’d have to start at the grass roots, not the international corporations’ massive profits and “investment flows”. The world as we know it continues to agonize about “financial instability” when the real instability is social. The world as we know it continues to agonize about “financial instability” when the real instability is social. I am reminded of Polanyi’s “double movement”, which he talked about in the Great Transformation. He pointed out that a prior globalization at the time caused so much social dislocation that societies across the ideological spectrum put up various forms of social protection and went against the current towards a self-regulating market. One movement in the direction of what is called globalization that was led by those at the top, another in the opposite direction, a double movement. Societies put up various barriers and protections in place to manage the social costs associated with the particular ways that the international economic system was being designed. I think it is important thought to talk about the different ways in which the international economy could have been set up. Like, the ideas in the New International Economic Order, or the ideas that came out of the World Social Forum (the Another World is Possible are good sources for that). I don’t think that many people are against trade, because I think that things like NAFTA are largely about things other than trade. Same with the WTO. The backlash is against the foundational ideas in those agreements and institutions, as well as those like the IMF. What I don’t see though is a coherent program that people are rallying around as an alternative. It seems that there is a chaotic response to the negative social costs associated with globalization. I also don’t see working people organizing across national boundaries tons at this point. This post needs more reflection on itself. Trade is irrelevant in the manner as you see it. Growth has slowed prime age population adjusted since 1974. The 74-82 was really miserable bad run of things considering the higher prime age population period required higher growth, which killed the new deal coalition in the US. Stuff like NAFTA is simply irrelevant as well. 1934-1970 was the greatest trade liberalization in modern times, yet the greatest growth. I think your problem is not understanding the limits of debt expansion, which is where the real problems are at. Brexit is really a market spat, with little to do with globalization. Many of your claims (unsubstantiated) need more reflection. How in the world is NAFTA irrelevant? You do realize that NAFTA is far beyond trade, yes? It isn’t a trade deal, it is an investor rights deal. Chapter 11 of the old NAFTA, for example, was about investor-state disputes. What does that have to do with trade? The chapters on government procurement, intellectual property? The NAFTA side agreements on labor and the environment (both weak by design)? The same rough ideas in NAFTA are found in CAFTA and lots of other bilateral trade agreements. The ideas, not the particular agreements they show up in, are the problem. And what I was talking about was far beyond trade itself. It was the integration of different economies around the world and the setting up of uniform rules that slowly undermined the sovereignty of states, which is what Polanyi talked about in the Great Transformation. Marx talked about the same thing in the Communist Manifesto. If you missed it, I mentioned the IMF, which isn’t really an institution that focuses on trade. It forces other structural changes on countries that benefit powerful interests. The WTO deals with lots of things that have nothing to do with trade. I don’t know what you mean by this, or why you would conclude I have a problem in not recognizing debt, whatever particular debt you are talking about I am not sure. On this site, I have commented on the external debt of poor countries, private debt linked to private money creation, among other things. But I don’t know what you mean by that statement exactly, so clarify if you could. Again, I don’t know what you mean or whose growth you are talking about. This was the same rough time when social democracy, actual social democracy, dominated the West. The modern European welfare state was cemented during that period, the New Deal and Great Society programs here in the US, Medicare up in Canada. It was a time when developing countries were using things like import substitution to try and support domestic industry, and it was also a time when the West attacked poor countries the world over that challenged the power of the West and implemented policies and ideas that the West found threatening. The US, from about the war of 1812 until WWII developed behind what we among the highest average industrial tariffs in what are now OECD countries. The only two countries (according to Ha Joon Chang’s book Kicking Away the Ladder) that had higher tariffs during that time was Russia before the revolution and Spain. Thereafter, the US was still highly protectionist and still has a highly protectionist agricultural system. That protectionism is actually the norm, not the exception to the rule. Most countries developed behind various forms of state protection, the US and Britain included. Most of the countries that have developed in the post WWII era (Japan, South Korea and China) developed by radically violating the rules of free trade and free markets. And Chang has shown that the growth rates of the neoliberal period among developing and underdeveloped countries is actually lower than in the period that came before it. I was, again, talking about things far beyond trade. It was an integration of the international economic system along particular lines, integrating at times economies with radically different living standards, environmental, financial and labor regulations, at radically different developmental phases, sometimes integrating democracies with dictatorships or feudal-type states. Other ideas were out there but were ignored. When NAFTA, the WTO or the TPP was being negotiated, were labor, environmental and consumer groups at the table and did those groups have nearly as much power in those negotiations? That is why I brought up the NIEO and the ideas that came out of the World Social Forum. Telling me about growth rates doesn’t say who the growth went to and what exactly grew, what ecological impact the growth had, if the growth was equitable, among other things. The economy here in the US has grown since the crash. What does that growth mean to a poor person living in the south side of Chicago or poor communities in Detroit? Who has the growth went to? What parts of the economy have grown? Was the growth equitable? The importation of subsidized American corn was expected to drive 7 million subsistence Mexican corn farmers off their land. Based upon subsequent immigration patterns I would suggest that this was an accurate prognosis. The Mexicans got cheaper tortillas and US the got an expanded work force. 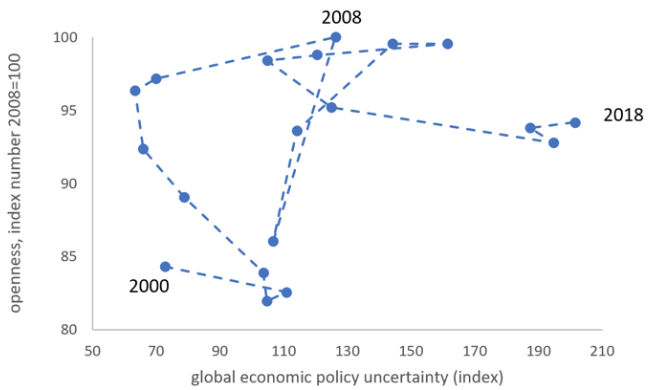 In any case, it is unclear to me what constitutes “global economic policy uncertainty“. Apparently it is some sort of (index), but you would never know what is in the index from the article. Nice idea; but van Bergeijk takes a big bite and the article is garbled and badly delivered in my estimation. Sorry about the mixed metaphor. Mexican corn farmers had been struggling since the late 60’s. That is a large reason why the great Mexican migration started in the early 70’s before cresting in the 00’s. Lets note, things started going very wrong in the 70’s……………. Trade is of course part of NAFTA, but it is far beyond just trade. I think another victim of overall economic liberalization in Mexico has been the ejidos, which is a shame. If it was just a deal on trade, I would call it a trade deal. NAFTA has had major impacts on the environment, especially in Mexico. Or, the role it has played in stifling union organizational drives, how worthless the labor side agreement is in regards to union organizing in Mexico. Canada has lost more investor state disputes than the US or Canada, but Chapter 11 was used to sue Obama regarding his decision on the XL pipeline. Originally, they wanted $13 billion, if I am not mistaken. Financial firms were talking about using it to challenge financial regulations. I could see it, or investor state disputes in other deals and institutions, being used if we wanted to move towards single payer. The WTO gutted portions of the 1990 Clean Air Act amendments within a few months of its existence. It has impacted other environmental agreements like the Endangered Species Act, and it has undermined renewable energy industries and programs in multiple countries. Investor state disputes have been used against Canada to undermine reforestation campaigns. Thanks Grant. I don’t mean to be picky, but I worked with the Clean Air Act on a daily bases from 1994 to 2002, and I am unaware of the WTO gutting any portions of the CAA. Clarify if you would please. BTW Gary Gray. It is my understanding that Mexican subsistence corn farmers were subsidized by the Mexican government prior to NAFTA, and when the US corn exports kicked in the Mexican government subsidies ended. What was a trickle became a flood. The Venezuelan complaint suggested the possibility of a fundamental conflict between domestic environmental policy and U.S. obligations under international trade rules. Most importantly, it provided a stern first test for the World Trade Organization, the infant organization heralded as the world’s most important economic body. And did the cheaper tortillas taste the same or taste different? And were the cheaper tortillas nutritionally the same as the prior tortillas or were they nutritionally different? I say have all the globalization you want as long as everything is mandated to be shipped under sail! Deglobalization just means that the developed world will no longer be part of the next phase of globalization. China will take over the hegemon position in the developing world, and globalization in the developing world will continue in a similar fashion as it has since the 1980s (when the U.S. and the rest of the developed world was leading the charge and benefiting from being the printers of the world’s reserve currencies). pollution, income inequality, CO2 emissions, etc. are all negative externalities—-something one learns in the latter half of Econ 101. A guy named Coase got a Nobel Memorial Econ. Prize for it. Yet it astonishes/frustrates me that in the media, economists consistently gloss over/hand-wave this concept. Globalization “works” in its present form solely because so many negative externalities are dumped onto the developing world, the bottom 75% of the developed world, etc. Please reincarnate me when the moneyed’s greed stops, becomes controlled, or abated. No, globalization=excessive consumption. Force consumers not to spend personal wealth and your problems will be solved ala offshoring, which was created by excessive consumption. This creates pressures on business to offshore and cheapen quality. It also drove deregulation for cheaper prices. feel a tad better. It’s not working any more. I concur. The globalization and the Forced Free Trade came first. The overconsumption of Cheap Chinese PlastiCrap came second. Abolish Free Trade, restore militant belligerent Protectionism so that American bussinesses will not be punished by alien undercutting when they attempt to make half-as-much twice-as-good stuff; and American consumption patterns will evolve back towards more shinola and less sh*t.
Real globalization will occur under the rulership of Jesus Christ with the Kingdom of God running all here on Earth after the complete and total destruction of this worldwide system and its adherents so all can live in peace and harmony under one set of rules. Man rules man to his injury, always has with all the games that are played with Satan as the real ruler of this current system. Will we get to pet pandas and tigers (assuming there are any left) in you new system? Yes….but it was caused by a great increase in poverty, from the Great Depression. How can a period of poverty be call “de-globalization”? Yes demand fell, but the demand was not met by locally produced goods, there was an absence of buyers. Yes, immigration followed a similar path in its contraction from previous history due to economic collapse. The “locally” produced goods myth always cracked me up. The GD was massive capitalist contraction that has no comparison when the pound died as the global reserve currency. WWII was then the race to find who the next leader of the broken order. I think there are a set of “deglobalization” warriors who need to give it a rest. That includes many who “support” globalization. They can’t tell the difference between a neoliberal catfight and “deglobalization” obviously. IMO, what we are seeing now is a neoliberal catfight due to slow growth after the 2008 downturn. Which goes back to debt expansion and its limits. This triggered “Brexit” IMO. The US itself has a 20 trillion dollar economy nominally and 7-8 trillion of that is just garbage economic growth based on debt since 1980. That is a major major problem. I would rather have a smaller economy more structural sound than that mess. The myth there is some great populist wave going on, cracks me up. I see the opposite. The neoliberal elite are starting to attack each other. Who needs populism then? Eventually as you say, we will have another GD and THEN comes the populism. This is like so many economic articles and Paul Krugman, it is short-sighted. Yes, globalization is receding due to resource restraints and climate change. Yes, the Trump Trade Wars, Brexit, and 737 Max crashes are symptoms, not causes. But the actual causes aren’t discussed; probably due to funding and ostracization. Parallel and concurrent with the transfer of manufacturing to Asia to bust unions and lower worker wages was the spread of financialization in the West. Supranational institutions (NAFTA and the EU) were formed to regulate trade and degrade nation states to cut corporate taxes and end regulation. Western nations are no longer competent nor democratic. Corporations were deregulated and become global monopolies so powerful they control politicians themselves (Bayer, Boeing, Purdue Pharma or Volkswagen). Commerce corrupted. Competition ended. To ease the burgeoning debt that was transferred to the nation states from the Great Recession, austerity was imposed on the people of North America and Europe. Mid America and England are globalist colonies. The people (Yellow Vests) are pushing back. This is why Donald Trump and Teresa May are ripping apart America and the British Isles and two Boeing 737 Max 8s fell from the sky until belatedly grounded. This figure seems to me quite problematic. Openness measured by looking at trade flow *growth*. So the world was less “open” in the decade post-GFC? Deglobulisation was the response when this stopped working. The engines of global growth were fuelled by debt. They gradually spluttered and stalled when they couldn’t take on any more debt. There was one engine of global growth left, China. It gradually spluttered and stalled when they couldn’t take on any more debt (Minsky Moment ahead). Same ideology, same economics, same mistake. You may have noticed the error my spell checker didn’t. My spell checker insists deglobalisation isn’t a recognised word.